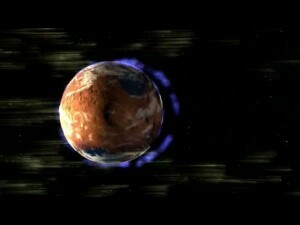 Mars’ atmosphere may have been depleted following the loss of the planet’s magnetic field. Illustration courtesy of NASA. On this week’s How On Earth, we’re joined by the University of Colorado’s Bruce Jakosky, principle investigator on the MAVEN satellite mission that will investigate Mars’ upper atmosphere. NASA granted final approval to MAVEN last fall, and the spacecraft is scheduled to launch in 2013. Also, Ted Burnham speaks with Carol Finn, incoming president of the American Geophysical Union, about the need for scientists to communicate better with the public.